Quisumbing compilation lists Typha capensis and Typha angustifolia as synonyms. Other compilations lists them as separate species. CZECH: Orobincem uzkolistym, Orobinec úzkolisty. FRENCH: Massette à feuilles étroites, Massette des étangs, Quenouilles. GERMAN: Schmalblaettriger Rohrkolben, Schmaler Rohrkolben. ITALIAN: Lisca a foglie strette, Mazza sorda, Stiancia minore, Tifa a foglie strette. NORWEGIAN: Smalbladet dunkjevle, Smalt dunkjevle. SPANISH: Anea, Espadaña común, Espadaña estrecha, Junco de la pasion, Macio de hoja estrecha. VIETNAMESE: Bon bon, Thuy huong. Lampakanay is an erect swamp plant reaching up to 2 meters in height. Leaves are long, linear and 10 to 12 millimeters wide. Spikes are exserted, cylindric; the male flowers superposed above the female ones; the female ones when mature are brown, 12 to 20 centimeters long and up to 2 centimeters in diameter. Fruits are very minute, with membranous pericarp. - Widely distributed in the Philippines at low altitudes in low wet places and in shallow or stagnant waters. - Also used as ornamental in garden ponds. - Also occurs from Africa and Madagascar to New Guinea. - Study isolated stearic and propanetriol ester, quercetin, naringenin. Considered anticoagulant, anti-contusive. anodyne, astringent, aphrodisiac, diuretic, emetic, emmenagogue, hemostatic, sedative, styptic, tonic, vermifuge, vulnerary. 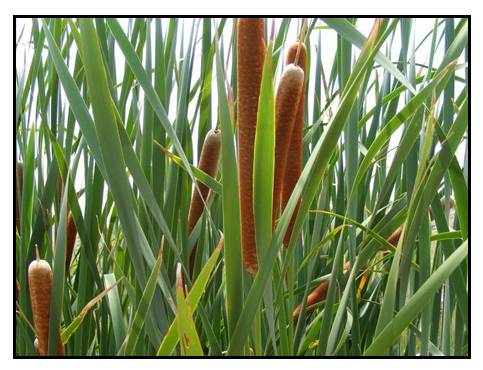 · All parts of the cattail can be eaten. · Core of young flower shoots are tender and can be eaten raw, with a taste of cucumbers. · Rhizomes and seeds (with fluffy parts burnt off) processed to make flour. · Green flower stems cooked on the stick and eaten like corn-on-a-cob. • Hematomas: Mix 9 gms of the dried material with 4 gms gumamela (Hibiscus rosa-sinensis), in one cup of baby's urine (suckling). Boil to decoction and drink. • Wooly soft Inflorescence is hemostatic, used for dressing ulcers and wound healing. • For herpes labialis, cheilosis, swelling of the tongue: apply powdered preparation on lesions. • For dysmenorrhea, post-delivery pain: grind to powder 3 to 9 gms of dried pollen preparation and drink with warm water or wine. • Pollen used for kidney stones, dysmenorrhea, abnormal uterine bleeding, abscesses. • Used for tapeworms, diarrhea, dysentery. • Root infusion used for gravel. • Roots are used as diuretic; used for urethritis and dysentery. •Zulus use a decoction of root in the treatment of venereal diseases; Xoas use it as an aid to expel the placenta. • Used to strengthen uterine contractions. Also used to promote fertility in women, to enhance male potency and libido, to improve circulation. • In Chile and Argentina, used in folk remedies for tumors. • Tea of roots and leaves used for stomach cramps. • In South Africa used to treat male fertility problems. • In India used as refrigerant, aphrodisiac and cure for dysuria. • In Chinese medicine, used for angina, brain clots, high lipids, difficult urination, chronic colitis, hemorrhoids, boils, rash in infants. (Source) Also, used in treatment of hypermenorrhea. (Source) Also, used as astringent for dysentery and for hemorrhage of the bowels. Stamens, without the pollen, used as astringent and styptic. • In Antilles the pollen is used as substitute for powder of licopodio; hairs and seeds used against burns. • Weaving: Stems and leaves used in making paper, woven into mats, hats. • Building: As building material, used for making thatch. • Fuel: Source of biomass, compost heap, or fuel. • Pollen highly inflammable and used in making fireworks. • Seeds used to stuff pillows and clothing insulation. • Extensive root system makes it ideal for stabilizing wet banks of rivers and lakes. • Immunosuppressive Effect: Immunosuppressive activity of Pollen Typhae ethanol extract on the immune responses in mice. Study showed ethanol extract could suppress humoral and cellular response in mice. • Cholesterol Lowering Effect: Five aliphatic compounds were isolated from the pollen of TA. Compound IV showed significant lowering of serum cholesterol. • Cerebrosides / Vascular Smooth Muscle Effect: Study yielded two new cerebrosides from the pollen of Typha angustifolia, both exhibiting effect on the proliferation of cultured vascular smooth muscle cells induced by fatal bovine serum. • Processing Effects on Flavonoids and Polysaccharides: Study showed processing temperature, yellow wine and vinegar affected the chemical constituents, influencing flavonoids and polysaccharides in different degrees. Analysis on contents of flavonoids and polysaccharides in pollen of Typha angustifolia L. and its different processed products / Zhongguo Zhong Yao Za Zhi. 2000 Jan;25(1):25-8. Typha ssp. 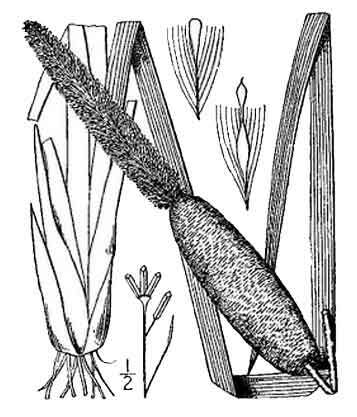 / Typhaceae / Cattail – James A. Duke. 1983. Handbook of Energy Crops. unpublished. Sorting Typha names / Maintained by: Michel H. Porcher / MULTILINGUAL MULTISCRIPT PLANT NAME DATABASE / Copyright © 1997 - 2000 The University of Melbourne. It is not uncommon for links on studies/sources to change. Copying and pasting the information on the search window or using the DOI (if available) will often redirect to the new link page.